If a doodle lives right, eats all its veggies, and cleans up its room…it gets to be a full-blown painting. 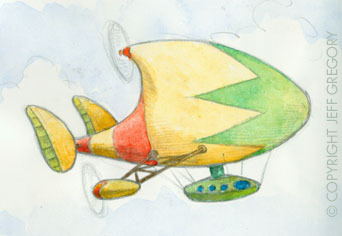 Reason for this one: I just like the way the word “aviatrix” sounds. Although it started out random, this one turned into an homage of sorts to one of my heroes, George Herriman. He’s the genius who gave the world Krazy Kat, and his artistic and writing skills have always been a benchmark by which I judge other comic work. His stuff may be too surreal or subtle for some tastes, but- love him or hate him- ya gotta admit, the man had STYLE! Mad Dogs and Puffin’ Bunnies! It’s the age-old philosophical question: “Is the bunny running away from the bee, or toward the giant partially sketched finger?” Hmmmm……. What never was….but may yet be. 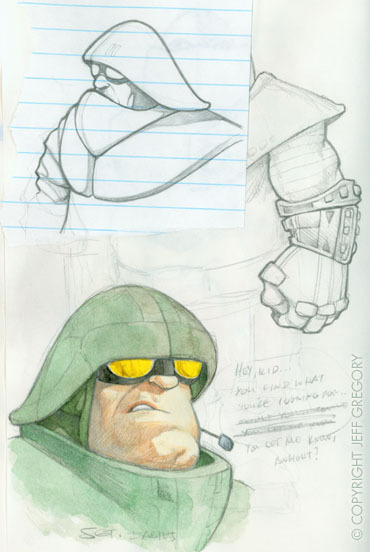 Sketches for a work project that, unfortunately, was shelved before full-scale production began. I still believe this needs to be produced, and I’m hoping and praying that it will be given a second chance. If it doesn’t happen here, I may soon start production on my own on the side. I’ll keep you posted. Since these pieces are kind of large, I have just thumbnailed today’s post. You know the drill….click on the thumbnails to see the larger pics. This guy started out as a light bulb…and then I drew a mouth on it …and- voila! – you’ve got yourself a man! If that ain’t proof of evolution, I don’t know what is! Friends don’t let friends do decongestants and doodle. I don’t know about the rest of you, but I don’t think the warning labels on these medicines are quite complete. I strongly recommend they add “may cause hallucinations, drooling, and the occasional out-of-body experience”. Just a fun motion study. Traditional frame-by-frame animation done in Flash8. I know, I know…”but you could just tween it!” What can I say- I still think the old ways are better sometimes. Here’s a piece I did for work. It’s done in watercolor on illustration board. The article was about the lousy dating habits of some Christian men, and what a turn-off it is to the women in their lives. Oh, who am I kidding…this one is basically what happens when you have an office window that looks out over the highway. I love drawing extremes of facial expression. 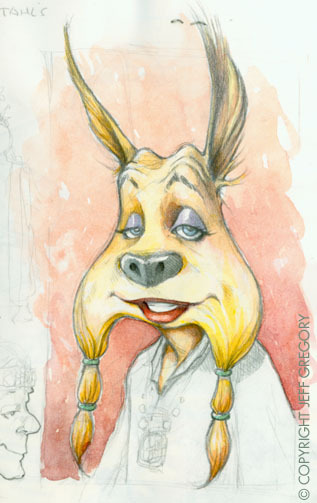 Here are a few from one of my sketch books. I gave myself the task of doing a straight pen-and-ink drawing with no pre-penciling. I was pretty happy with the results. I used some old black-and-white photos I found online as reference. That’s the great thing about image searches…you can find all kinds of reference material! All hail the internet!